With the “lazy” days of summer almost over and schools throughout Marin already starting the 2014-15 school year, there’s no better time than now to start thinking about MMWD’s Water Wonders education programs. Our fun, informative programs offer something for everyone, including indoor and outdoor educational opportunities, hands-on water conservation and restoration activities, whole-school assemblies in English and Spanish, service learning projects, and school bus reimbursements. 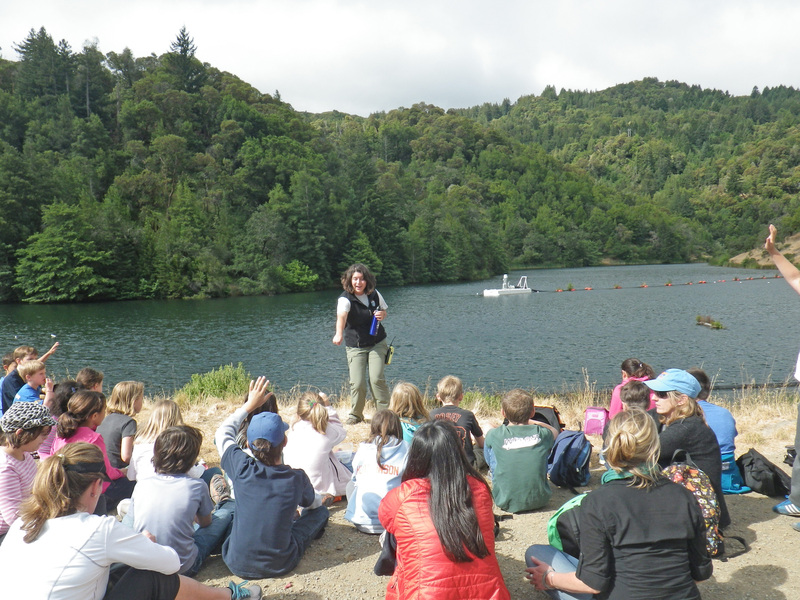 Last year, MMWD’s Water Wonders programs provided education to thousands of K through 12th students throughout Marin. This year, we expect similar demand, as water seems to be on everybody’s mind with California’s ongoing drought. By participating in the Water Wonders program, students will learn about drought, and gain an understanding that droughts are an unpredictable and naturally recurring part of California’s variable climate. Students will also learn about simple, positive actions they can take to conserve water at home and at school. Through MMWD’s “Do-It-Yourself Water Conservation” program, students are empowered to take water conserving actions at home—something that’s always important, but even more so now, during these times of drought. Students learn to evaluate their household’s water use and identify ways to conserve water by checking their toilets for leaks, installing water-efficient showerheads and faucet aerators, and reviewing their irrigation systems, among other things. MMWD provides free showerheads and faucet aerators to households that need them. The Water Wonders brochure provides detailed information about all of our programs as well as contact information for making reservations. Programs are offered on a first-come, first-served basis and fill up quickly. All programs are offered free of charge and are designed to support California education standards while fostering water conservation and environmental stewardship. We hope you’ll join us this school year! The first step is to make a reservation for one or more of our water education programs. Double Your Clothes Washer Rebate! Buy a qualifying high-efficiency clothes washer and get $50 from MMWD, plus another $50 from PG&E. You’ll enjoy a total savings of $100 immediately—and water and energy savings over the life of your washer. Models that qualify for these rebates are the most efficient washers on the market today. They use at least 60 percent less water and 50 percent less energy than washers that simply meet federal standards. Some models use as little as 12 gallons of water per load of laundry. At this rate the savings can really pile up! For information about MMWD’s clothes washer rebate program visit marinwater.org/rebates. For information about PG&E’s clothes washer rebate, click here (then scroll down for rebate information). The MMWD and PG&E rebate programs are administered independently. Please check with PG&E for complete information about their rebate program. Since the late 1990s, more than 16,000 high-efficiency clothes washers have been installed in MMWD’s service area through our rebate programs. That’s a lot of laundry—and significant water and energy savings, especially since standards for high-efficiency washers have increased steadily over the years. Years ago, a clothes washer was considered efficient if it used 30 gallons per load. These days, to qualify as a Consortium for Energy Efficiency “Tier 3” model, a high-efficiency clothes washer must use 12 gallons or less. Some new washers use as little as seven gallons per load! Not only do high-efficiency washers save water and energy, they also tend to be popular with our customers. Survey results from hundreds of our customers indicate that at least 90 percent would recommend their high-efficiency washer to a friend. With the success of our past programs, we’re delighted to bring back our popular clothes washer rebates—along with high-efficiency toilet and smart irrigation controller rebates, too! For complete details visit marinwater.org/rebates. After a four-year hiatus, we’re pleased to announce rebates are back! This is your chance to save water, energy and money by installing qualifying high-efficiency toilets and clothes washers and smart irrigation controllers. Purchases must be made on or after September 1, 2013, to qualify. Visit us online at marinwater.org/rebates for complete program information, including qualifying product lists and application materials. High-efficiency toilets (HETs) are designed to use less than 1.3 gallons per flush while retaining superior flushing performance. The models that qualify for a rebate from MMWD have passed rigorous testing standards to achieve the U.S. Environmental Protection Agency’s WaterSense label. Since toilets are the single biggest water-users inside your home, replacing an older one with a new high-efficiency model is an easy way to trim your water bill. To apply for a high-efficiency toilet rebate, simply review the program terms and conditions listed on the application form. Then purchase a qualifying toilet and submit your completed application with your original receipt. 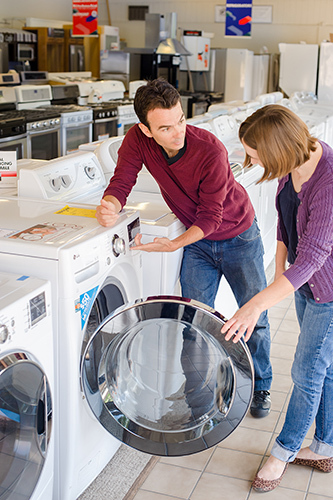 High-efficiency clothes washers exceed federal efficiency standards. Washers that qualify for a rebate from MMWD are designed to use 12 gallons of water per load, or less. That’s less than half the water (and energy) needed by a washer that simply meets today’s federal efficiency standards. If you do a lot of laundry in your household, the water and energy savings can really pile up. 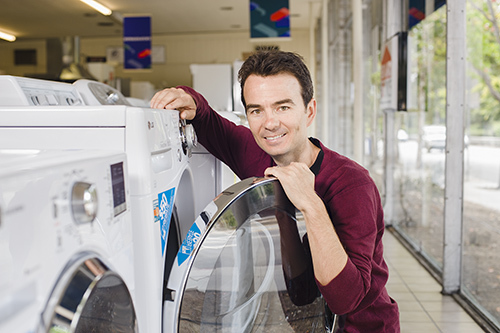 To apply for a high-efficiency clothes washer rebate, simply review the program terms and conditions listed on the application form. Then purchase a qualifying clothes washer and submit your completed application with your original receipt. Smart irrigation controllers are designed to self-adjust based on real-time weather and site conditions like rainfall, wind, temperature, humidity, solar radiation and soil type. Smart irrigation controllers tailor watering schedules to actual site conditions, minimizing water waste and conserving water. While it’s tempting to fall into a “set it and forget it” approach, it’s important to remember that smart irrigation controllers are part of an irrigation system. They can perform as intended only if the system is properly designed, installed and maintained, and if the controller is installed, programmed and maintained properly. To apply for a smart irrigation controller rebate, contact MMWD’s Water Conservation Department at (415) 945-1527 to schedule a water conservation site survey, before purchasing your new controller and after reviewing program terms and conditions. The water conservation survey will help you identify ways to conserve water at your property, both indoors and out, and will take about 60 to 90 minutes to complete. During the survey you will receive additional information about smart irrigation controllers to help you decide if they are a good match for you, as well as an application form. After you purchase your qualifying smart irrigation controller, submit your completed application with your original receipt. Rebate amounts are based on the number of active irrigation stations as determined during the survey. Funding for these rebates comes from the Marin Municipal Water District and the Safe Drinking Water, Water Quality and Supply, Flood Control, River and Coastal Protection Bond Act of 2006, administered by State of California, Department of Water Resources. Bay Area water agencies are coordinating to provide this rebate program, funded in part under a regional grant to Bay Area Clean Water Agencies under the Safe Drinking Water, Water Quality and Supply, Flood Control, River and Coastal Protection Bond Act of 2006, administered by State of California, Department of Water Resources. Start the School Year With a Splash! Believe it or not, the school year has already started in many areas throughout Marin—and that means it’s time to roll out another exciting year of MMWD’s water education programs. If you’re a busy teacher, be sure to reserve your place today. If you’re a busy parent, remember to encourage your child’s teacher to participate in MMWD’s water education programs. They’re fun! They’re free! They’re educational! 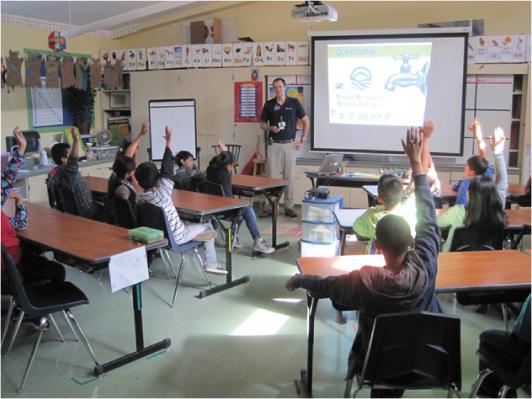 Last year, MMWD’s Water Wonders environmental education programs provided outreach to thousands of students at public and private schools in Marin. Through MMWD’s programs, students learned all about water—from source to supply to conservation. Many students had the chance to reinforce classroom concepts by visiting our beautiful watershed lands and participating in restoration and conservation activities. High school students were also invited to visit MMWD’s Water Quality Laboratory where they learned about current drinking water regulations, analyses and instrumentation, as well as the specifics of water quality here in MMWD’s service area. Elementary school students continued to learn about the importance of clean water and fish habitat by hatching and releasing trout through the “Trout in the Classroom” program, offered in partnership with North Bay Trout Unlimited, California Department of Fish and Wildlife, and AmeriCorps Watershed Stewards Project. The Water Wonders brochure provides detailed information about all of our programs. This year, we are excited to introduce some new educational opportunities while continuing to offer long-term favorites. Hot off the press is our “Marin Municipal Water District” poster—a great addition to any classroom, providing a fun and informative overview of MMWD’s watershed, reservoirs and treatment plants, as well as the people, plants and animals who share our water supply. Be sure to order your free copy today. Also new this year is our expanded school bus reimbursement program. Now, all schools that book an MMWD-guided field trip to the Mt. Tamalpais Watershed can apply for a reimbursement for travel costs. A limited number of reimbursements, up to $500, are available on a first-come, first-served basis—so book your field trip today! Finally, don’t miss out on our exciting new classroom presentation, “The History of MMWD and Preservation of Mt. Tamalpais,” given by Jack Gibson, author of Images of America: Mount Tamalpais and the Marin Municipal Water District. This presentation can be tailored to the needs of your students and is a great way to enhance your students’ understanding of local history and the rich tradition of environmental protection in Marin. Programs are offered on a first-come, first-served basis and fill up quickly. All programs are offered free of charge and are designed to support California education standards while fostering water conservation and environmental stewardship. Bilingual (English-Spanish) classroom presentations and assemblies are available. We hope you will join us this school year in educating Marin’s students all about water. Jump in and make your reservation today! Click here for contact information. Thank You Garden Hosts, Volunteers, Sponsors & Guests! The Marin-Friendly Garden tour was a huge success with over 600 guests making 2,200 visits to nine diverse gardens on Saturday, May 18. Gardens featured native plants, edibles, rainwater catchment, smart irrigation, wildlife habitat, salvaged materials and more. (See photos of the gardens on our Facebook page.) In addition to strolling through these inspiring gardens, guests had the opportunity to attend on-site presentations by local experts on rainwater harvesting, defensible space and gardening with California natives. 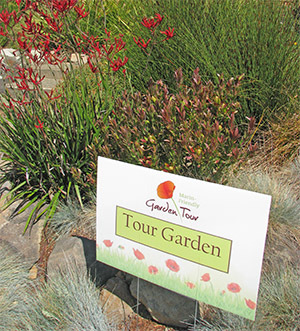 We hope the tour inspires visitors to embrace gardening practices that are easier on the environment, in particular ones that conserve and protect our precious water resources. Last, but not least, we would like to thank everyone who attended. We hope you enjoyed the tour as much as we did! Why is Marin-Friendly Gardening Important? Perhaps the interconnectedness of gardens, watersheds and people is nowhere more apparent than in Marin. Almost all of our water supply comes from local rainfall, collected from local watershed lands and stored in local reservoirs. Unlike most Californians, people in Marin live in the same watersheds that supply our water, witnessing first-hand the impacts of our activities on our local waterways. It’s apparent that what we do in our gardens has a direct impact on water quality in our local creeks and waterways, and on the plants and animals living here. Marin Municipal Water District watershed lands total over 21,000 acres, and are home to over 400 species of animals and 900 species of plants, including many rare, threatened and endangered species. The watershed comprises only 0.2 percent of the area of California and five percent of Marin County, yet 15 percent of the state’s native plant species and 50 percent of the county’s can be found here. Lagunitas Creek, which begins above district reservoirs near the peak of Mt. Tamalpais on land owned by MMWD, is a spawning and rearing ground for endangered coho salmon and steelhead trout. It supports one of the best populations of coho salmon in California. In addition to its critical role in nature, water plays a central role in our gardens. All plants need water to survive, but different plants need different amounts of water. Many plants that grow in Marin naturally have adaptations that allow them to survive through our hot, dry summers without any supplemental irrigation. Other plants, like thirsty lawns, require constant watering and maintenance. In Marin, a lawn the size of a tennis court needs about 400 gallons of water per day in July to remain healthy. That’s equivalent to having 16 people each taking 10-minute showers at your house every day! When you consider that irrigation systems are never 100 percent efficient, even more water is needed. Much of this water is wasted due to runoff, which travels into local waterways carrying harmful chemicals and other pollutants with it. Marin-Friendly gardening is grounded in the notion that there’s a better way to achieve productive, beautiful gardens and minimize our impact on the environment. 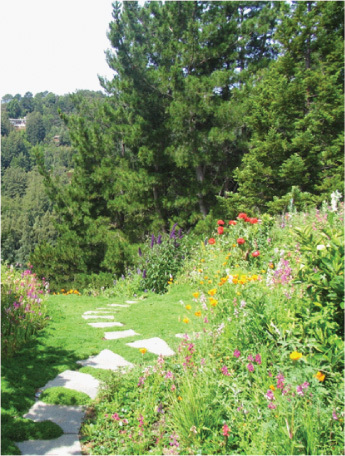 Marin-Friendly gardens use practices sensitive to our local environment, particularly ones that conserve and protect our precious water resources. Want to see Marin-Friendly gardening in action? Join us for the Marin-Friendly Garden Tour on Saturday, May 18.